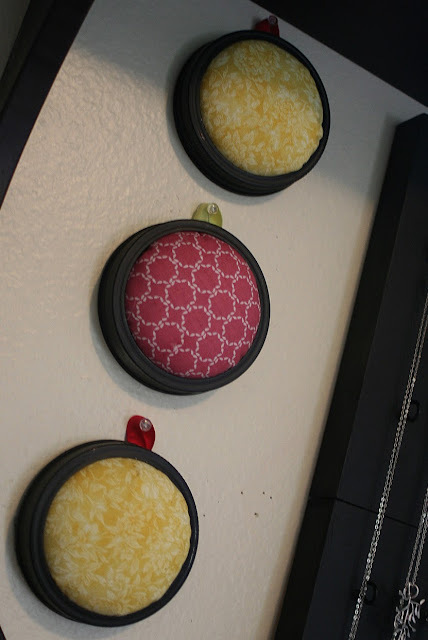 I thought it was a really smart idea to hang them, since I have little guys who like to get into everything. I made these four. I tacked them up by my sewing machine and put all my needles on one. I am always losing my needles and now I won't be. One more step towards controlling the chaos. Check! It was quick and easy and I like how it looks, too. Thanks for letting us use your great tutorial, Kendra. Take a little trip over HERE to see her full tutorial. Thanks for dropping by! I love these! I will definitely be making myself some of these! Perfect! Thanks for directing to the tutorial. Those look great! They look right at home under your purple picture. Those look really neat -- now I've got to figure out where my jar rings are hiding. Love your green sewing chair! What a neat idea! And they look so cute on your brick wall. I don't know if you do, but I love the chair! It's so retro and awesome! I would love one of those in front of my sewing machine! Ooh great idea! No more pulling my box down just to grab a needle. I love this! Thanks so much, I'll be linking also. We had the same chairs in the kitchen when I was a wee one. Thanks for the feature! I love mine and use them ALL THE TIME. Have no idea where the idea came from but I'm sure glad it did!